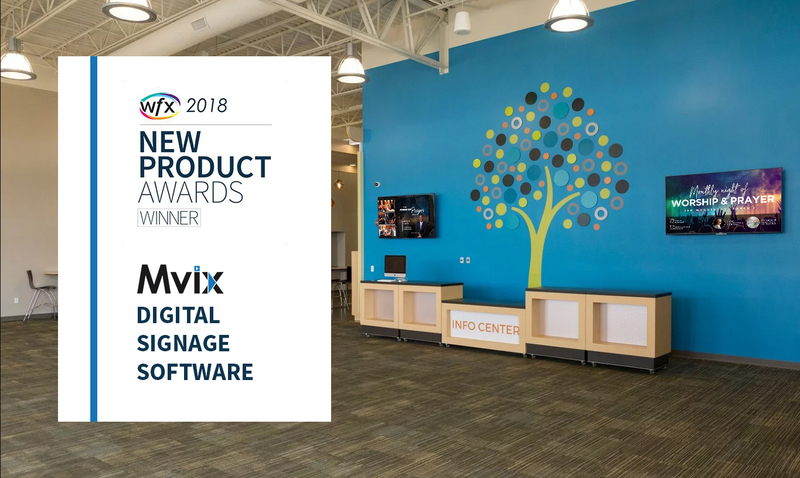 STERLING, Va., November 16, 2018	(Newswire.com) - Mvix, a leading provider of content-rich digital signage software and solutions, today announced that they won the 2018 WFX New Product Award for Church Digital Signage. Presented by Worship Facilities Magazine and Worship Tech Director, the awards recognize manufacturers of products that stand out as a benefit to churches of all sizes and styles. It's an honor to be recognized with this award at our very first appearance at WFX. Digital signage is changing how houses of worship engage with their audiences and our software empowers them with a content-rich solution that is easy to use and cost-effective. The 2018 award was presented to Mvix for its content-rich, cloud-based digital signage software. The software enables churches to remotely manage, update and display dynamic content on digital signs, video walls and interactive displays and kiosks - all from one platform. In addition to the content apps, XhibitSignage has management features such as multi-user access, playlist management, screen-layout editor, calendar-based scheduling and day-parting, and reporting. Mvix is a leading provider of content-rich digital signage software and solutions. To date, their platform powers over 50,000 active screens for clients including First Baptist Church of Glenarden, First Baptist Church of Greenville, Virginia Tech, Discovery Channel, Crowne Plaza, and the University of Washington. The use cases include employee communication, wayfinding, emergency messaging, and customer communications. Learn more about Mvix at www.mvixdigitalsignage.com.